In the last installment of my travelogue series, I promised to blog on the church in the medieval walled city of Carcassonne. I wanted to do that separately since I had enough material and pictures to warrant its own post. The church goes by a few different names. Here is the sign posted outside its entrance declaring that it is the Basilique des Saints Nazaire et Celse. The English language handout I acquired inside gives the name of the Basilica of Saints Nazarius and Celsus. Unfortunately they did not have anything detailing the stories of those saints, but I found a lengthy tale online from a Catholic forum. Another online source has Saint Nazarius as being an abbot during the time of Clotaire and is said to have "attacked the heathendom on the southern coast of France." The handout suggests that the earliest church on that site was built during the 6th century during the "reign of Theodoric, regent for the Kingdom of the Wisigoths (sic)." It then states that the first written mention of this church was in 925 when Bishop Gimer was transfering the "Episcopal See from St. Mary and Savior's church in the surrounding country, to the church of St. Nazaire with the city walls." The church has been renovated many times and it is said Pope Urban II stayed in Carcassonne for five days in June 1096 after having made his infamous call for the crusades in Clermont. While in Carcassonne, he blessed the materials that were used for the Romanesque building. The plan called for a single nave, 2 side aisles, an apse with 3 chapels and the transept. The Romaneque nave adopts a disposition frequently observed in churches of the Bas-Languedoc: Barrel vaulting with doubled arches (nave), and barrel vaulting again for the especially narrow side aisles. The 2 side vaults act as buttresses for the central vault. Here you can see the narrow barrel vaults on the side aisles. The handout also points out that visitors should note the alternating round and squared columns. The history of France, and particularly the south of France, is of a series of conquests. After the defeat of Carcassonne by Simon de Montfort, the king of France wanted this Romanesque church to be replaced with a Gothic one. However, the funds ran low and rather than tear down the entire structure, it was amended. Here is my favorite picture as it shows the seams of where the pointed Gothic arches meet the rounded Romanesque arches. Outside the church you can see that there are still remnants of it being a "work in progress." The scaffolding alone suggests that they are actively trying to restore aspects of the edifice. But inside you do not get the sense of construction. It is a place of worship and quiet contemplation. 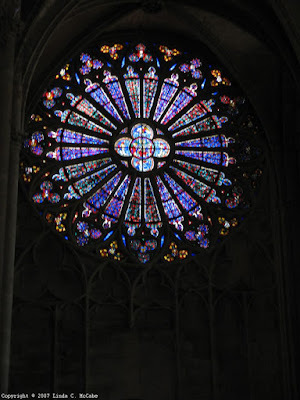 Here is a picture of the North facing rose window which dates from the 13th century. Here is another shot at a slightly different angle showing off the architecture of the building more. Here is the South facing rose window which dates to the 14th century. Then on the floor I saw this tombstone. The handout has several mentioned, and so I am unsure who this image is supposed to represent. Here is a baptismal font in front of a statue of Jeanne d'Arc. And a close up of the Maid of Orleans. This church remained a cathedral until 1803 when the Episcopal See was transfered to St. Michael's church in the modern Carcassonne. Later Pope Leo XIII made St. Nazaire into a Lesser Basilica. Next in my series will be the hilltop village of Puycelsi overlooking the vast Forêt de Grésigne. I'm glad you liked them. Thanks for stopping by. Great pictures. They must have really inspired your writing, yes? You're so lucky to get to travel like that and to have such a great personal focus -- your book!! Yes, I was inspired in ways I could not have anticipated. I not only saw in person the places that I had written a story around, but I learned things about the French culture and history that I could not have otherwise. It was an amazing experience and I look forward to traveling to Europe again sometime in the future. I do have a sequel to write and I did not travel to Aachen. I am glad you liked the pictures as well as my text explaining them. I find it a pleasure to recall the experiences of that incredible trip. Lovely photos. Why the alternating round and squared columns? Did they say why it was constructed this way? The handout that I had picked up from the basilica did not specify why the columns were alternating in their style. I looked online at the official website of Carcassonne as well, and there isn't any answer their either. There are however, similar pictures to the ones I took. Sorry I did not have the answer to your questions, but while I am enamored of medieval architecture I am certainly no expert. Thank you for the sensible critique. Me and my neighbor were just preparing to do a little research about this. We grabbed a book from our area library but I think I learned better from this post. I'm very glad to see such great information being shared freely out there.